Craftster Community > CRAFTSTER CRAFT CHALLENGES > Archive of Past Craftster Challenge Entries > CHALLENGE 25 ENTRIES > collage! Bendigo Australia, small city, big heart. collage! Bendigo Australia, small city, big heart. There is so much i want to say about my home town. but all i can really put into words is how much i love it. it is entirely unique in every way, from its historic background, to its multiculturalism, to its fresh and ever changing arts and music scene. Even though i have only been living here for six years myself, i would call it my home town. i have travelled to many countries in the world, even living a year in china. and all i ever wanted when i was away was to return home. i go to university here now, and get involved with the cultural aspect of Bendigo a lot. originally i made this collage as a sort of preliminary map for a small art quilt, and even collected the fabric for it. however, i had never used a sewing machine before and when i started making it, i actually broke the machine. (from my own misuse of it.) so here is my tribute to my wonderful town, in collage form. one day to be a quilt! bendigo has an old gothic cathedral, trams, a chinese precinct and is known for the gold rush. i forgot to include its title as the city in the forest, because it is still surrounded by natural Australian 'bush'! 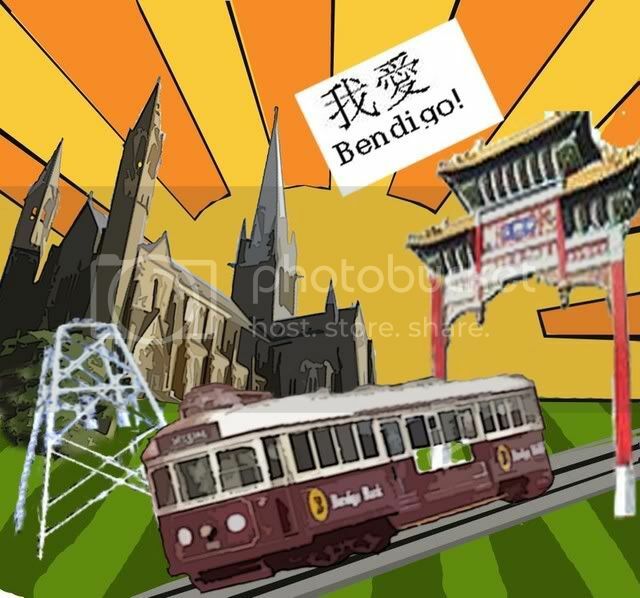 also the chinese says 'wo ai' (i love) Bendigo! Re: collage! Bendigo Australia, small city, big heart. I'm from Sydney but I love Bendigo! The colours and shapes are really gorgeous, good work! I never knew it had a Chinese precinct. it just has a museum, some gardens and a beautiful arch. right in the center of town though. its beautiful!